WordPress powers as much as 40% of the world’s internet sites, and that says a lot about its influence. There is no doubt that the WordPress website development platform is a favorite of many bloggers and entrepreneurs. Can you believe it that companies as large as Forbes, Business Insider, and Time use WordPress to run their sites? So, if you are an aspiring blogger, it is an exciting venture to think that when you use WordPress, you are sharing the same platform with those large enterprises, as well. It says a lot about the power and possibilities of WordPress, and it indeed is one of the most trusted website platforms currently available in the market. If you are starting with your website setup, you will quickly realize that there are two kinds of WordPress: WordPress.com and WordPress.org. What is the difference between the two, and is there any reason for you to choose one over the other? It can be confusing since both sites carry the same brand. You must know the advantages and disadvantages before signing up for your account since going with one over the other makes a big difference on your website’s future. But, first off, how do you know which one is the better for your business? To answer this question, you must look within your enterprise and identify your short and long-term goals so you get an idea of what you must sign up with. 1. What are my short and long-term goals? To begin with, ask yourself as to what you want to use WordPress for. Are you just finding a way to hone your writing skills? Are you only finding a way to publish your previous journal articles? If your goal is to transform your blog into an extension of your journal, then WordPress.com works just fine. It is because WordPress.com does not give you permission to put affiliate links on your website. Therefore, you cannot sign up for advertising options with other companies. Your monetary compensation is minimal unless you already are a successful writer, gamer, or entrepreneur. However, if your goal is to monetize your blog, WordPress.org is the way to go. You will have the freedom to customize your blog, put on marketing banners, affiliate links, and integrate plug-ins like Mail Chimp and SEO tools. You can also input as many codes as you want, without being limited by the restrictions of the WordPress.com platform. If you are limited by your budget, WordPress.com certainly costs a lot less than WordPress.org. You can start with this platform; then, when you are ready to take your blogging to the next level, you can change to WordPress.org. You shouldn’t worry about data transfer though because WordPress.com can be easily exported to WordPress.org. There is an “export” feature that lets you transfer data in just one click. For WordPress.com, all you have to pay for is your domain, private hosting, and personalized email, which all-in-all does not exceed $50. However, for WordPress.org, you have to pay for your server and all the other tools that will get you started. It is not cheap, so you must be ready for all the expenses especially if you are not entirely adept at building and running a website. If you are a novice, you must consider hiring a professional website designer. 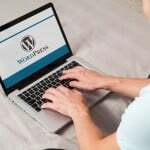 There is a massive difference between the strengths of WordPress.com and WordPress.org. Consider your options and make it a point to be consistent with your goals so you would know which platform to choose. I’m a copywriter, not much into technicalities and definitely, not into coding. The best option for me was WordPress.com. It’s easier to tinker around with their classic WISWYG. I think it’s a matter of requirements. But for simplicity’s sake, I’d say my bet is on WordPress.com. Almost everything you can do with hardcoding can be done through WordPress.com too, with certain packages and some hefty prices at times, eyyy.